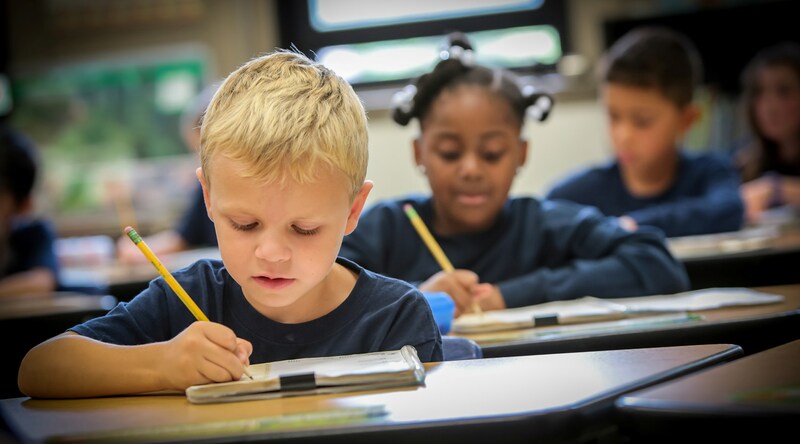 All three campuses offer students the same exciting and challenging curriculum based on high academic benchmarks such as the Massachusetts Frameworks, Common Core and National Science and Math standards that are consistent across all grade levels from Preschool (Age 2.9) to Grade 8. A Catholic Faith Formation curriculum is taught at every grade level. The academic program employs a variety of techniques that are a combination of traditional and contemporary approaches to learning. Teachers, using research-based best practices, engage students through lively discussion, problem-solving, and active participation. There is continuity in skill building insured through the use of sequential materials in Religion, Language Arts, Mathematics, Science and Social Studies. The well-planned curriculum is organized into units of study that promote reading, writing, and critical thinking across all subject areas. Students not only get a solid foundation in literacy and mathematics skills, but also are pushed to develop their creative and analytical thinking abilities for lifelong learning. The curriculum promotes strong Catholic values throughout and our instruction and assessment programs are geared to high standards. In addition to the strong academic environment and Catholic Faith Formation, the school day offers a range of electives, including lively instruction in music, the arts, technology and physical education. The learning environment is enhanced by state- of- the- art school buildings which have all been renovated. The school campuses feature science labs, computers in every classroom, music, art, and media rooms, gymnasiums and cafeterias. After school programs such as drama and sports, as well as academic tutoring, are available so that all students can develop their own personal talents along with a strong educational foundation. Beyond Grade 8, Saint John Paul II Catholic Academy students, aided by guidance counselors on each campus, gain acceptances to local high schools, including Archbishop Williams High School, BC High, Cathedral High School, Catholic Memorial, Cristo Rey, Fontbonne Academy, Matignon, St. Joseph's Prep, Ursuline Academy, and Xaverian. Students also attend Boston Latin School and Boston Latin Academy. Our graduates are fully prepared for the academic demands and social adjustments of high school, college, and beyond.